I am a legal historian, specializing in pre-modern European legal traditions. I am particularly interested in the history of criminal law and the historical development of legal and political institutions concerned with punishment, dispute settlement, and social control. My research also ranges more broadly into the development of the western legal tradition, with an eye toward comparing developments in English and Roman law. My first book, Sanctuary and Crime in the Middle Ages, 400-1500 (Fordham University Press, 2011) won the John Nicholas Brown book prize from the Medieval Academy of America. I am currently working on a monograph that examines the legal career of the devil in pre-modern Europe. I teach upper level undergraduate and graduate history courses. I also teach undergraduate courses in the Legal Studies Program and the Sociology Department, and occasionally in the Law School. 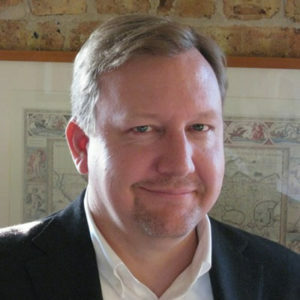 I currently sit on the Board of Directors of the American Society for Legal History, and am the incoming president of the Association for the Study of Law, Culture, and the Humanities. I am also a member of the American Bar Association’s Standing Committee on Undergraduate Education. Karl Shoemaker. Who Deserves to Die? : Constructing the Executable Subject. University of Massachusetts Press, 2011. Karl Shoemaker. 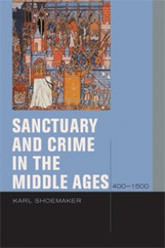 Sanctuary and Crime in the Middle Ages, 400-1500. Fordham University Press, 2011. “The King’s Two Bodies as Lamentation,” Journal of Law Culture and Humanities (forthcoming 2015), pp. 1-15. Regarding Untimeliness: Medieval Legal History and Modern Law,” Critical Analysis of Law: An International and Interdisciplinary Law Review 2 (2015) pp. 199-213. “The Devil at Law in the Middle Ages” (“Le Diable et le droit au Moyen Âge”) Revue de l’histoire des religion 228 (2011) 567-586. 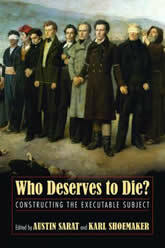 “The Medieval Origins of the Supreme Court’s Prohibition on Executing the Insane,” in Who Deserves to Die? : Constructing the Executable Subject, eds. Austin Sarat and Karl Shoemaker (University of Massachusetts, Amherst, 2011).